Centrally situated, on East Finchley High Road (close to the junction with Creighton Avenue), we are an independent second-hand record shop. 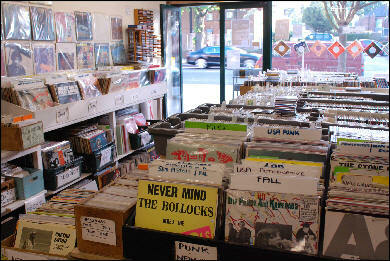 We sell vinyl, CDs and tapes as well as music memorabilia. All types of music are here for you to find, with a large, constantly changing stock of over 15,000 records and 3,500 Cds, including many rare and collectable items. Soul, Reggae, House, Dance, Blues, Hip-Hop, Jazz, Rock, Punk, World Music , and most other types of music in existence! We are regularly used by musicians and DJs seeking out new breakbeats and samples. We also buy collections.